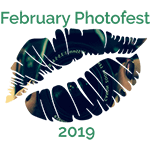 February Photofest 2019 - Day 11 - Toy for Sir - February Photofest 2019! Feeling pretty in coral roses! Click the kiss for more photos by amazing folks!